Hi, my name is Holly. I am one of the library technicians in the Durham Tech Campus Library. You’ll usually see me at the desk in the evenings and most Saturdays. If you have been in the library in the evenings or on Saturdays, you may have noticed that there is a tiny laptop that sits near the computers at the circulation desk. This little computer is called an Interpretype. I am hard of hearing, so I use this device to communicate with people at the desk more efficiently. People with hearing loss have more difficulty filtering out all of the unnecessary noise, like typing, copy machines, talking, etc. Often people who speak fast or have accents are more challenging to hear as well. The Interpretype is simple to use as long as you are familiar with a computer and with instant messaging. If not, then there’s always the option to just write down your request. 1. 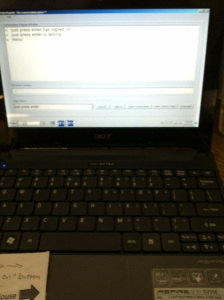 Hit the ENTER key first so that the question will go into the correct text box. 3. Your question will show up on my computer and I will respond accordingly. 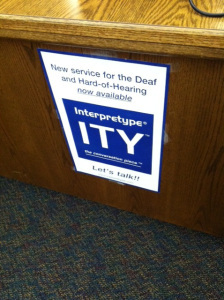 The Interpretype is also available for any library patrons who are deaf, hard of hearing, or have any other communication barriers that can be overcome by using this device. Help me serve you better by spreading the word. The more people who are familiar with how the device works, the more quickly I can provide assistance. NoveList Plus is a great tool for readers and book clubs. It is designed to help you find information on your favorite titles, authors, or series, including recommendations for your next great read. Happy browsing and reading with NoveList Plus! Remember to ask the library for a password if you would like to access this resource remotely via NC LIVE. Do you want to learn strategies for avoiding plagiarism? Do you want some hands-on practice creating citations? Do you want to be more comfortable using MLA and APA citation styles? Tues. Nov. 29th 10:00-11:00 a.m.
At the end of the workshop you will be given a certificate to verify your attendance. Welcome to Durham Tech Library’s New Blog! Welcome to the Durham Tech Library blog! I have been a librarian at Durham Tech since October 1989. In the past year, we have made significant improvements to the library space. Some of these, such as a library classroom and better soundproofing, have been needed since the library opened in 1987. In addition to new paint and carpet, we created a large group study room (learning commons), doubled the size of the computer lab to create a library instruction classroom/open computer lab, and added acoustical panels and sound masking. We also replaced all the chairs in the library. It is our hope that students with all learning styles can find a comfortable place to study in the library. According to the network administrator for the college, a greatly improved wireless network will be in place by the end of 2011. Please let us know how we can help you to be successful in your classes at Durham Tech.